One easy way to save space in your warehouse is to look for big, open spaces in your rack system. If you have pallet racks but not all of your inventory goes into full pallets, one quick way to save space is to use that rack for something else. Are higher velocity items close to the ground and easy to access? If you are stacking free-standing product on top of itself, use stronger packaging if it's cost justified; the space and time saved in the warehouse would have to exceed the new packaging costs. 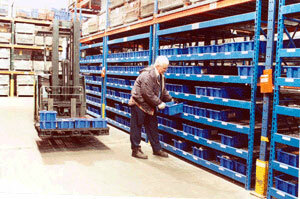 This is an example of replacing part of a rack with each-pick carton flow to maximize the space. It utilizes pallets racked above, and carton flow below for access to bins or cartons of product. The "80-20" principle applied to live storage in ways that increase your available space and your picking productivity. A single level of carton flow track can be added to pallet rack--an ideal way to store slow movers above high-volume movers. Pick access and visibility are increased.